Real Wood Bracelet Box or Jewellery Chain Necklace Display Gift Boxes. Genuine Wood with high polish finish. Size approximately 250mm x 60mm x 40mm. 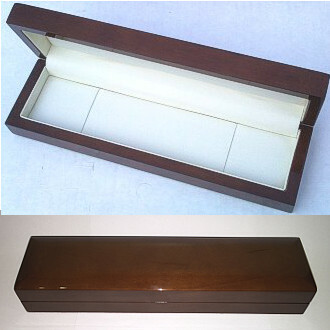 Large Bracelet Wooden Box with leatherette internal trim, high quality jewellery box to really show off your Jewellery piece! Wood colour shade may vary from illustration.